Glenavon boss Gary Hamilton has promised changes for tonight’s Danske Premiership clash against ailing Glentoran at the Oval. The Lurgan Blues crashed to a shock defeat at home to basement side Ballinamallard United at the weekend - a performance that left their manager shell-shocked. But they have an ideal opportunity to erase that memory when they make the journey to East Belfast to face a side that appears in total disarray. 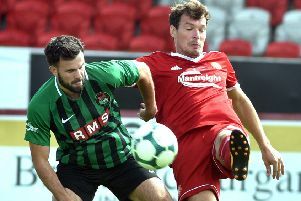 Glens manager Alan Kernaghan walked away following a shock League Cup exit to Annagh United - but with veteran Director of Football Roy Coyle in charge for Saturday’s league game against Ards, the players again fell way short. Hamilton, however, prefers to put his own house in order. “We had no enthusiasm and no energy,” he said. “It was a poor performance. We usually create loads of chances, but it just didn’t happen against Ballinamallard. “Credit to them. They came with a game plan and stuck to it and it worked for them. They were better than us on the day. Paddy McCourt had his penalty kick effort saved by former Lurgan Blues shot-stopper James McGrath. “If that goes in, the game changes, but that’s what happens with penalties,” added Hamilton. “That was probably the game-changer, but anyone can miss from the spot. Coyle, who is hoping to have striker Curtis Allen and midfielder Marcus Kane available, branded his team’s efforts against Ards as ‘embarrassing’. He is anxious to get a new man installed at The Oval sooner, rather than later.